Hot off the heels of the successful Lighthouse West Tower, Daniels welcome Lighthouse East Tower at Daniel Waterfront - City of the Arts - an iconic, waterfront address, steps from Lake Ontario, Sugar Beach, gorgeous parklands, trails, dining, shopping, entertainment, and the downtown core. Bordering Lake Shore Blvd. East and Richardson St., the 36-storey Lighthouse East Tower will introduce a new era of waterfront living. You have access to 27,000 square feet of handy retail, restaurant, cafes, and coffee shops, alongside numerous arts, cultural, and academic organizations that will be headquartered here. Life is sweet at Daniel Waterfront - City of the Arts. 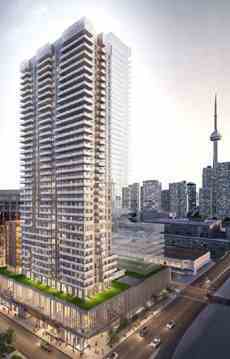 Lighthouse East Tower is a condo development by The Daniels Corporation and located at 13 Richardson Street, Toronto. Hop on the TTC right outside your front door, or walk or cycle to Union Station, or drive in the Gardiner expressway to get to your destination. Exciting opportunities are all around you!